OVERSTOCK 53849 Single Pocket Deposit Bag Clear 9 x 12"
5Forms Business Checks & Forms > Deposit Products > OVERSTOCK 53849 Single Pocket Deposit Bag Clear 9 x 12"
Make deposits after-hours, and protect deposits from theft with heavy duty bags that meet all Federal Reserve guidelines! 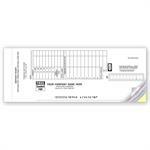 Tamper-evident tape closures and additional features protect against theft or alteration. A space has been added on the bag so that you can stamp your personal and banking information on the bag rather than having to fill out the bags by hand every time. Functional and eco-friendly. All-clear #4 recyclable plastic with single pocket. Stronger Material: We've updated these best-selling deposit bags with stronger yet thinner plastic and a new look. New Ultra-level Tamper-Evident Closure: Indicates our highest degree of security against all mechanical (hand-pulling), chemical (solvents), thermal (hot air and freezer spray) and moisture tampering attempts. Easy to use. 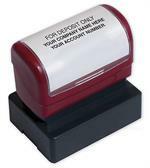 Tear off receipts for convenient tracking and deposit identification. 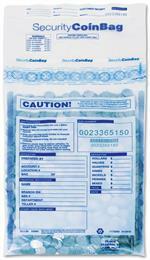 Unique barcoding and numbering on bag and receipt for easier processing with less risk of errors. 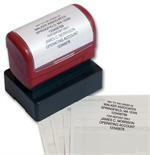 Use with Security Bag Endorsement Stamp (D2037): To imprint your name and banking information; eliminates the need to mark every bag by hand which may lead to processing errors. 100059 Booked Retail Deposit Tickets 8 7/8 x 3 3/8"
53860 Heavy Duty Coin Deposit Bag Clear Large 12 x 25"
D2037 Security Bag Endorsement Stamp 2 3/16 x 3/4"
$14.00 OVERSTOCK 53849 Single Pocket Deposit Bag Clear 9 x 12"